Cottages still present today. There is a plaque on the south wall VR 1855. The photo doesn't show a large enough area to assume the whole region is flat. There are level areas as big as this on Salisbury Plain, my first thought was that this is Larkhill. Probably not. Stables with gallops to the upper right? rather a lot of tracks emanating from this point? I agree. I've also looked for a windsock, but couldn't find one (it would make quite a roomy airfield). A close up aerial photograph of what had been Hainault Farm Aerodrome, Hangars and associated buildings when owned by John Smith & Company as their Hainault Works. No. 44 Sqn. (Home Defense) was formed at Hainault Farm and remained there for the duration of first World War. I agree this is definitely the old RFC/RAF Hainault Farm Aerodrome. Sopwith Camels were based there to intercept the German Gotha bombers raiding London. It was closed as an active airfield after the end of the 1st WW in 1919. Soon after this the aerodrome buildings were purchased by by John Smith & Co Ltd of Shaftesbury Avenue, as their new Hainault Works. Hence there aren't any windsocks or any other identification of an active airfield. The airfield land reverted to farm land after the airfield closed. John Smith's manufactured tents, tarpaulins, marquees, aircraft hangars and other heavy textile products. It was not an airfield during WW2. It continued as the John Smith & Co factory becoming part of the Black & Edgington Group in about the 1960s. 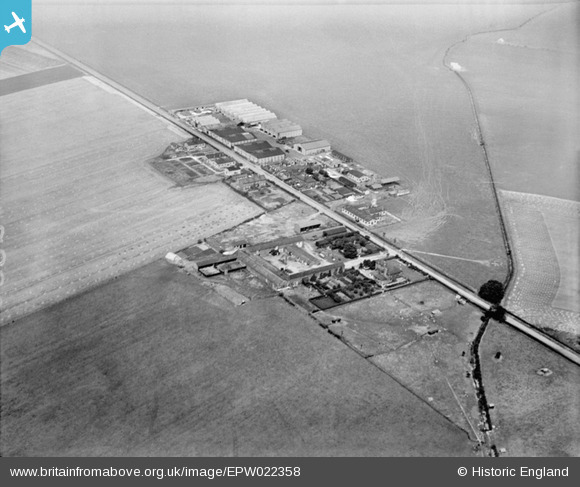 A new airfield RAF Fairlop with hard runways and perimeter track was built nearby during WW2. Hainault Farm,Hainault Rd,not sure of postal town,but NE of Aldborough Hatch,Essex.This was the site of Chigwell airfield in WW2. I can confirm that I have checked this out and it is Hainault Farm, Romford. Some of the cottages are still present today. Hi martyk, another great "spot", thanks. We'll update the catalogue and post the new location information here in due course. Great job. This is a view looking north-east over Hainault Farm in Hainault Road, Ilford, Essex (in the London Borough of Redbridge). 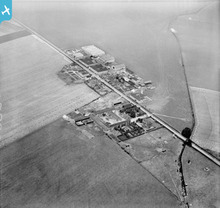 The land, and some of the buildings, on the far side of the road, north-east of the farm, were part of the Royal Flying Corps Hainault Farm aerodrome in the First World War. Hainault Road itself is not a Roman road, but dates from the mid 1850s, like the farm, when much of Hainault Forest was disafforested and turned over to agriculture. Several long straight roads now bisect the area of the former forest.